**This review contains pertinent information that gives away the endings of the previous books. Please do not proceed unless you have already read the previous books in this series. 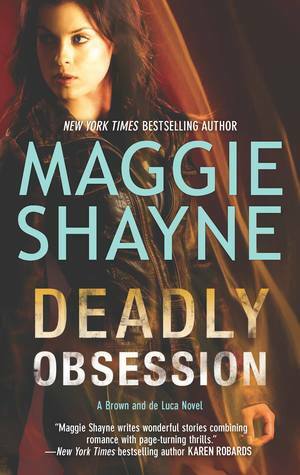 As I had mentioned in my Pre-Review of Deadly Obsession, Maggie Shayne answered a question on GR stating that there was going to be a fifth installment of the Brown and de Luca series. I haven't seen much else about this news aside from another GR question answered by Shayne, that gives a tentative release date for fall of this year. And then there's the reference to an older book, The Gingerbread Man, of which I will probably be checking out from the library in the next few days, because READING MOOD. Anyway, I'm looking forward to seeing what there will be in store next for this series, because as it stands, Deadly Obsession actually feels like a pretty well-rounded conclusion to the Brown and de Luca series, if that was what Shayne is going for. If not, I suppose we'll be seeing even more stand-alone novels being pushed out centering around Rachel and Mason, and frankly, I'm not complaining. If I had to describe how I felt about Deadly Obsession, I'd actually say that it was the most exciting, edge-of-your-seat installment of this series. It doesn't really have a mystery, per se, since we already know up front who the serial arsonist slash killer is. And we also get to see into said arsonist/killer's head, and it is definitely NOT a steady place to be. There's a pretty twisted mind floating around the world of this fourth book and it's kind of scary. As was the case with the previous books, the action starts out immediately, with Mason rushing into a burning building to save babies, thus cementing him in every woman's mind as the perfect, wonderful hero he's always been (aside from that one little set-back with his brother being an evil serial killer and how he covered up that evidence, and all). Mason regains a bit more depth in this fourth book than I had seen from the previous installment, but he still comes off a bit carbon-copy, so I hope that the next book will be good for him. Instead, Rachel's continued complexities makes me continue to love her more and more. And I love that she doesn't react like a typical romance novel heroine to many different situations she is presented with. And I'm also kind of glad that her jealous side is so transparent and childish when it comes to Mason's home care nurse, "Nurse Boobsalot," but that at the same time, she's quite level-headed about her feelings. But being level-headed on the outside doesn't mean that she's not going to resort to childish name calling and unabashed web stalking of said new nurse who all but charges into Mason's home with the obvious mission of seducing him, even with Rachel standing right there. And I find it even more amusing that even Mason's nephews have caught onto the home care nurse's seduction plans, while Mason's just all, "Well, she seemed so desperate for a job that I just couldn't turn her down. What do you mean she's got a thing for me?" Because it's kind of cool that he doesn't seem to notice or care... though, honestly a little unbelievable. Because as Rachel points out, there's no way a hot-blooded man like him couldn't notice the centerfold model body on that woman. I looked out the front door as a nymphomaniac prostitute in a Nurse Goodbody costume got out of a little red car and Beyonce'd her way to the door. "I thought it was June. It's still June, right? 'Cause this looks like Halloween to me." Jeremy said, "If she says 'trick-or-treat,' Dad, give her me." I turned slowly, tearing my eyes off the breast-feeding-mother-sized breasts that were revealed by the open top of her white, button-down, skintight, micro-mini nurse getup. Yea, it was that bad. One of the things I found sweet was how the boys, Mason's nephews, realized that Nurse Gretchen was trying to seduce Mason, and decided to let the nurse know that it was no good because of how Mason's "crazy about Rachel," and so Gretchen's pre-occupation with Mason was a waste of time. The entire tone Jeremy (the seventeen year old) took when speaking to Gretchen felt pretty protective of Rachel, and that was just all sorts of sweet and made me smile. The interactions between the characters have always been pretty excellent, especially within this newly minted little family of uncle, nephews, and Rachel, plus the dogs. I wouldn't mind seeing more of them in future installments being all "happy, warm family" with each other. And again, despite the fact that we already know what's going on--with the psychotic arsonist, and Mason's sister-in-law being a danger to them as well--the book was every bit a page-turning suspense to find out how things would pan out in the end. As with the previous books, this one was probably damn near perfect in spite of the switching POV narration. The events were fast-paced and straight-forward, and I didn't really feel like there were too many tangents taken that would sidetrack from the main conflict. We get to see more of Jeremy as an individual rather than just a kid in the background in Mason's life. We get to see more of twelve-year-old Joshua as well and some bits of youthful wisdom that really makes you think. But all-in-all, the story flew by pretty quickly and you're left with a gaping hole and thoughts of, "Oh. It's over? Already?" And then we proceed to pout and await the next installment. Oh, but also, there's a very obvious mistake in the story line that apparently didn't get caught: Mason's partner, Rosie's wife is named Gwen in this book, when in previous books she was named Marlayna. I thought there might have been just a typo at first, but she is referred to several more times as Gwen in this book, so it seems like it was just one editing mistake that should probably be fixed.